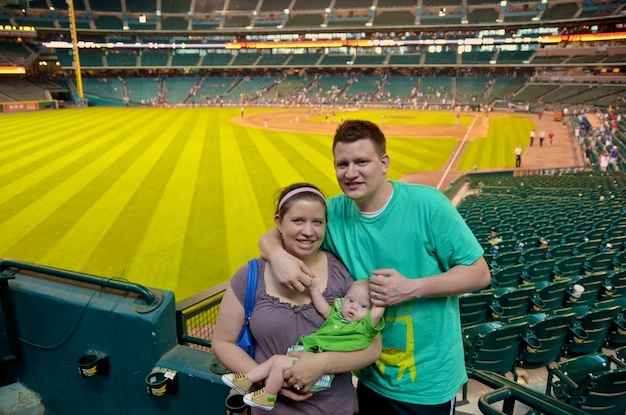 We had a chance to take Noah to Houston this weekend for a mini vacation. In fact it was his very first vacation! It’s rare that my wife and I both have a weekend off together, so we thought we’d take advantage of this rare occasion and head to Houston to visit some of our closest friends…and meet some new ones! Noah had a blast at Minute Maid Park! The less luggage you bring, the fewer trips you have to make back and forth from the car to the hotel room. Car seats get really heavy, really quick. You never know when your baby will feel like crying, or laughing……loudly. It could be at a resturtant, in the middle of the night, or right as the pastor as finishing up his closing point. You just never know. Be prepared. Always. I love being a dad. I mean seriously. Going on vacations with my wife and son is a dream come true. It’s even more fun then I thought it would be. I’m typing this from our hotel room in Houston. It’s sort of weird to be documenting our son’s first vacation. I think about all of the places we will go, all the trips we will take, and all of the fun we will have. It will be fun to look back at this website with Noah one day and talk about all of the the “firsts” I was able to record. I am truly blessed. My prayer is that The Lord would bless us with many happy years as a family! Lol, so.. true, i have three almost grown children, I also pray for gods blessings on your family for more family vacations. @38230200b2275b73890ebca1c08798f1:disqus Thanks so much, how old are your children by the way? Your son is beautiful, and I am in love!!! I pray that you are able to bring about the awareness and change you seek. I look forward to watching him grow, “so big”!!! @d638096b1f963403e106e6b30a756d73:disqus thanks so much! Do you have any children yourself? I watched a few videos & he’s such an amazing, adorable little bundle of joy. I loved the 1 where you guys were typing on the keyboard then you would stop & he would wimpier then you would start again & he was happy. I know I’ve said this at least 500 times since I “met” you & Noah but it’s true-he’s a very adorable little boy. I’ve got to look for other words that mean adorable. LOL I hope you never get tired of hearing how adorable he is. May God give you & your wife the stregth to get thru anything that you need help with. May God always be there to give you hope when you have none, may you always know that he is with you-especially when you feel all alone. May you always know that you have people that will help boost you up when you are low & hopefully you know how much he loves you. Noah is a beautiful, bright little baby-he’s not going to let this get him down. He’s going to surpass the goals that you have set for him-you can see the determination that he has even at this very young age. This is the time to mold him-to help he be all that he can be. God will help you get on track & to stay on track. I hope you know that if you need to talk or anything that you have friends, not just me, but everyone who visits your blog, who visits Noah’s Dad FB page & those who visit YOUR FB page. Don’t ever be afraid to ask for help. May God Bless you, your wife & baby Noah. @cb9723984b74c7daa0ed675d44b8ebd5:disqus Thank you so much for your kind words. I really appreciate it.